Bookmakers are companies that offer sports betting. Only the best online bookmakers for Europe come through the selection of our website. This is done on the basis of our own experiences and those of our visitors. The bookmakers selected below have proved to be the best and safest on the internet according to our findings. Because of our strict bookmaker selection you do not run unnecessary risk and in this way you can play safely at the chosen bookmaker. Online casinos have not forgotten about the sports lovers either. The sports book of the casino lets you bet on football, tennis, basketball, rugby, Formula 1, cycling and much more. The advantage of this kind of sports betting is that it makes each match that much more exciting. Besides, your knowledge of sports can earn you quite some money. There are even a few gamblers who are earning tons of money with their predictions. You do not instantly require such large amounts of money. For just a couple of euros, you can already bet on sports and see what the match will bring you. Sports betting is extremely popular. You can of course visit a specialized bookmaker, yet most online casinos will nowadays be equipped with a sportsbook. This way, you can easily switch between your sports bets and another game in the casino. Betting on sports is definitely nothing new. The old Romans already bet money on the number one sport back then: chariot racing. Today, most people bet on football. Although horse racing (the modern version of chariot racing) is perfect for fans of sports betting as well. Pretty much every sport is suitable for betting. Even e-sports and virtual sports are on the rise. 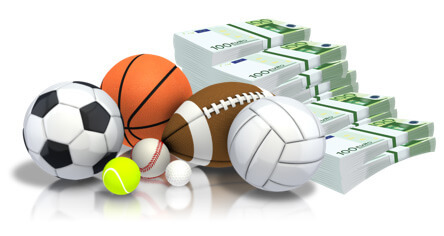 You will find various sports and competitions in the sportsbook. Will you go for a football match from the British Premier League, or are you more interested in the big tournaments, such as the World Cup or the Olympic Games? As soon as you know which sport, which competition and which match you want to target, you still have to look for an appropriate bet. In the football world, the regular 1×2 bet is most popular. You then bet on a win for the home team (1), the away team (2) or a tie (3). Besides this, there are various other bets to choose from. The first footballer to score a goal, the number of goals in the first half, or the number of cards: only some of the many possibilities. And for each sport, there are other bets to choose from. This way, betting on sports will remain interesting. How do odds and quotes work? For sports betting, you will automatically be confronted with quotes and odds. These are two different names for one and the same element. This element is quite crucial for you, as the gambler. After all, these quotes (which is the term that we will stick to) will decide how much profit you make with a bet. On the European mainland, decimal quotes are used most. These are numbers like 3.36 and 5.16. The British prefer to use fractional quotes, that are written like 11/8 or 5/2. The Americans go about it completely differently, by putting a plus or minus sign in front of it (such as -160 or +280). In order to not make it unnecessarily complicated, we will only discuss decimal quotes. Each sports bet is linked to certain quotes. Imagine that you, as a football fan, will go for a standard 1×2 bet on the Premier League match between Everton and Manchester United. The quotes for a win of Everton are 3.25, for a tie 3.60 and for a win of Manchester United 2.10. These numbers show exactly how much each euro you bet is worth. Do you bet 10 euro on Man United? Then the bookmaker will pay out € 21,- if you are right. For a tie, that single tenner might win you an amount of € 36,-. The higher the quotes, the higher the profit potential. But there is a catch. The bookmakers make an estimate of the match beforehand and set the quotes based on this prediction. For the match between Everton and Manchester United, the expectation is that the Man United players will win. This is reflected in the lower quotes. Yet when the top club Lazio is facing the much less impressive Hellas Verona in the Italian competition, the quotes might just look like this: 1.19 (Lazio wins), 7.50 (tie) and 13.00 (Hellas Verona wins). Because of the lower quotes, it makes very little sense to bet on a win for Lazio Roma. Although, in the surprising event of a win for Hellas Verona, you might just win a large sum of money in one go. The question is whether it is wise to take that huge risk. In the basics, it is really simple to bet on sports. You find an interesting match, study the quotes and then it is time to place your bet. Although you have to take some more steps before getting to this point. First of all, you have to look for a good bookmaker. You can opt for one of the bigger names in the world of bookmakers. Unibet and Betsson for instance, who specialize in sports betting. Yet you could also opt for one of the online casinos that have extended their offerings with a sportsbook. Perhaps you feel comfortable with Kroon Casino or LeoVegas. The most important thing is that you find a gambling company that is suitable for you. In your quest for a bookmaker, there are various selection criteria to keep in mind. Does the design of the website look appealing to you? Are there perhaps limits that you might be faced with? And is there a decent mobile app or website? Furthermore, you should consider the bonuses. Some bookmakers are happy to hand out a lot of special sports bonuses, whereas other gambling companies offer disappointingly little. Although new players are often welcomed with a welcome bonus. A 100% deposit bonus is most common. With this, the amount of your first deposit will be doubled by the bookmaker. Please take some time to carefully read the bonus conditions before gambling away the money. These conditions can be rather strict. Did you finally find a good bookmaker who is happy to hand out attractive welcome bonuses? Then it is time to take action and create an account. You only have to fill in some personal details and your player account will be ready. After that, you are not done quite yet. In order to actually start betting, you’ve got to have enough credits in your account. Money can be deposited through, amongst others, credit card, PayPal, classic bank transfer and e-wallets such as Skrill and Neteller. Also, payments through iDeal are accepted by an increasing number of bookmakers. As soon as the money is received, the betting can begin! If you only have very limited betting experience, it might be wise to opt for a pre-match bet. These are bets where you make your prediction before the match starts. During the game itself, no changes can be made. So are things not looking too good for your football team after the first half, despite your confidence in them? Then you unfortunately have to look on powerlessly as your bet is lost. In that aspect, live betting is much more exciting than pre-match betting. You can first take some time to observe the match and see how it progresses. Just don’t wait too long before betting. The bookmaker will be watching as well and will adjust the quotes during the match. This makes for an exciting game between you and the bookmaker. An increasing number of gamblers participate in live betting. It is obviously a plus if you are able to follow the match live. Thankfully there are a number of bookmakers offering their own livestream. No such service available? In that case, you will have to make do with a graphic display of the match. Not ideal, but still good enough to get a clear picture of what is happening on the pitch. Are you already excited about the prospect of betting on sports matches? Here are some tips in order to make your bets even more successful. Bookmakers get to determine their own quotes. The big advantage of this is that some differences will appear. As such, it might be better to go to Mr Green for the one bet, whereas the quotes for another bet are much more attractive at Kroon Casino. If you keep track of multiple bookmakers, you will always be assured of the best profit potential. Deepen your knowledge of the match you will be betting on. Are there injuries or is a player suspended? And has the top scorer been in shape lately? You do not have to perform in-depth research, but make sure that you are up-to-date on the latest sports news. Most bookmakers also offer detailed statistics, so that you can make a deliberate decision. No match is like the other. Once the end of the season is approaching, there might be very little to gain or lose for a team stuck halfway up the rankings. Qualifying for the Champions League is no longer an option, and there are no teams left that can still overtake them in the rankings. If this team is taking on another team struggling to stay in for example the Premier League competition, other concerns are in play. It is likely to become a game between a passionately fighting team and a team that is already longingly fantasizing about the summer break. Who would come out on top?